Oplev Georgiens historiske vidundere på en grupperejse fra Tbilisi. Fulldagsudflugt er fantastisk til rejsende, der er kort tid, men vil gerne opleve landet fuldt ud. Med rundturstransport fra dit hotel er der ingen grund til at stå over navigations- eller offentlige busser. Nyd guidede besøg på UNESCOs verdensarvssted Mtskheta, Gori og meget mere, før du vender tilbage til byen. What an incredible day with Sasha! Top crazy guide! Besides the amazing places he took us which would be impossible to do in one day using marshrutkas, he showed us Georgian culture through history funny stories to tell, good food and wine and music Sasha got the moves like Jagger. We also did the trip to Kazbegi and was superb! Thanks for curing my hangover with borjomi water and special smoke medicine . I had a wonderful first day in Georgia thanks to Sasha and his team who organized a great tour! I am here for a very short time for work and had only one day for a day-trip outside of Tbilisi and now I can at least say that I experienced Georgian culture! The guides were super friendly and attentive. I will leave with such a nice memory and impression of Georgia and will definitely book with them again next time I visit! I make this tour with David, who was excellent driver too imporant for Georgia and guide as well. The tour was terrific, with no rush. I also join in one other tour Kazbegi that it was excellent, as well. I would definetely recommend David! Thank you for all! 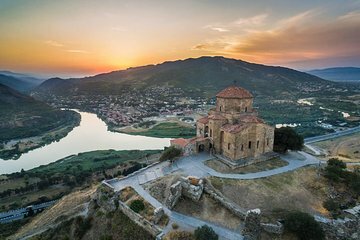 The tour covered Must-See places near Tbilisi with a reasonable price. Our guide, Anri is quite friendly and speak fluent English. I really enjoyed the trip. Thank you very much! This tour brought us to some wonderful sites! The tour guide grew up in Gori, so was able to give us an inside look. He was very flexible and willing to adapt the tour to our needs. We had a great lunch with a family in Gori and reached Jvari monastery right at sunset. Pickup and drop off at my hostel was very convenient. Georgia is a beautiful country, with beautiful people, and Soso Svianadze you are one of them. We would like to thank you very much, because we really enjoyed your guide, you showed us a lot of interesting places, always very kind with us and at full disposal for every need. Furthermore, as we told you, you have the right mentality with the tourists, knowing very well that the service in the most important thing in absolute. Thank you again and hope to see you soon here in Italy or in Georgia again. This was an amazing tour particularly the Uplistikhe Cave town. In this tour are different sites of Georgia with nice views. But the tour has gone better because of the Operator, GamarjobaGeorgia company. The guides David and Soso were so great in assisting us with our needs and explaining about the place as well. They speak good english and they also suggest nice food and drinks which are essential in any Georgia travel. I like their family-like warm welcome with us. It just made our tour more comfortable. This tour is highly recommended. The Guides given us were super sweet and helpful local people, 5 stars on that but there were NOT GUIDES. by that what I mean is the knowledge about the places were quite limited, we had requested English speaker guide which was given to us but I would rate the guides English 3 stars. I understand that English was not their first language but it becomes difficult to understand quite a certain things. Lastly, it would have been great if the guides given to us knew more about the places and not just the stuff that is available on google and wikipedia.